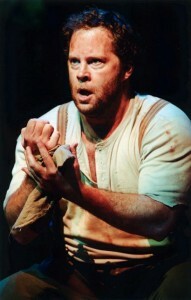 Shuler Hensley as Jud Fry in Oklahoma! It’s easy to give in to a sense of gloom and doom, or at least a lingering unease, about the health of live theater these days, especially with Atlanta-area companies facing ever harsher economic realities. The circumstances behind the recent shuttering of Theatre in the Square, after all, were hardly unique to that long-running Marietta playhouse. In the face of such uncertainty, the Shuler Hensley Awards for Excellence in High School Musical Theater offer a welcome shot of optimism and even exuberance about the future of local theater. The Shuler Awards are named, of course, for Tony-winning stage and film actor Shuler Hensley, a 45-year-old Georgia native currently starring in the Alliance Theatre’s much-anticipated world premiere of Ghost Brothers of Darkland County. After spotlighting Atlanta-area achievement since their inception in 2009, this year the Shuler Awards expanded their scope to include all of Georgia (they’re now also known as the Georgia High School Music Theater Awards). More than forty schools vied for 15 awards during the fourth annual ceremony, held on April 17 at the Cobb Energy Performing Arts Centre. Fayette County’s Starr’s Mill High School took home four awards for its production of Zombie Prom, which tied the amount awarded for Hairspray by Pebblebrook High School in Cobb County. See the rest of the winners here. Evan Greenberg (Riverwood International Charter) took home the award for Leading Actor for his role as William Barfee in 25th Annual Putnam County Spelling Bee. Brittany Dankwa (Tri-Cities High School) snagged Leading Actress honors for her portrayal of Celie in The Color Purple. The pair will compete with teen actors from across the nation at the 4th annual National High School Musical Theater Awards, which award acting honors, scholarships and professional opportunities for promising young actors. The awards take place at the Minskoff Theater on Broadway on June 25.